By Angie Drobnic Holan on Monday, January 25th, 2016 at 10:06 a.m. Some of the staff of Africa Check and PolitiFact in a meeting in Johannesburg, South Africa. The Poynter Institute for Media Studies, a global leader in journalism and the home of the International Fact-Checking Network, is launching a new initiative to fact-check claims about global health and development through a partnership with fact-checking websites PolitiFact and Africa Check, funded by a grant from the Bill & Melinda Gates Foundation. Facts about health and developing countries are often misunderstood or distorted. Poynter’s collaboration with PolitiFact and Africa Check will hold those making false claims accountable, and provide media and the public with context about complex issues. During a 16-month pilot, PolitiFact and Africa Check will research hundreds of claims and offer their analysis free to media and the public worldwide. The organizations also plan to create a list of online sources of information for reporters and others worldwide to use. The work is being funded by a grant for $380,000 from the Gates Foundation. "We're thrilled to work with PolitiFact and Africa Check to foster the growth globally of this vitally important work. Poynter's mission is to advance journalistic excellence that serves democracy, and I can think of no more timely initiative than empowering media organizations and citizens with the resources to understand the complex issues around health and development," said Poynter President Tim Franklin. "We look forward to working with the Gates Foundation on this critical initiative." No topic, person or place will be off limits for the fact-checkers. Independent academic researchers Lucas Graves of the University of Wisconsin and researchers from the University of the Witwatersrand in Johannesburg, South Africa, will study the impact of the fact-checking reports. "The facts about global health and global development remain vastly underreported in America and across the Western world. As we’ve seen with the Ebola outbreak in 2014, the stories or soundbites that do get reported or relayed are often inaccurate or misleading," said PolitiFact executive director Aaron Sharockman. "And in Africa and other emerging regions, misleading claims on these vital topics too often go unquestioned by the public and the media. We believe that fact-checkers can hold these bogus claims up to scrutiny and offer context about complex issues to citizens and policymakers." PolitiFact, which won the Pulitzer Prize for National Reporting in 2009 for its fact-checking coverage of the 2008 presidential election, has been providing context, clarity and accountability to political campaigns since 2007. Combined with partners across the United States, PolitiFact has created a database of more than 11,500 fact-checks — searchable by subject, speaker or rating on PolitiFact’s Truth-O-Meter. Africa Check, which was created with support from the AFP Foundation, has been producing reports on health and development issues in Africa since 2012. "Fact-checking is not a dusty academic exercise anywhere in the world, and never in Africa," said Africa Check founder Peter Cunliffe-Jones. "Across the continent, millions of people make decisions every day based on the best information available to them. So false and misleading claims about topics from health cures to access to drinking water cost lives. Our aim is to assist the media and the public across Africa and beyond to sort the fact from the fiction and we are delighted to do this in collaboration with PolitiFact and the Poynter Institute." The Poynter Institute for Media Studies is a global leader in journalism education and a strategy center that stands for uncompromising excellence in journalism, media and 21st century public discourse. Poynter faculty teach seminars and workshops at the Institute in St. Petersburg, Fla., and at conferences and organizational sites around the world. Its e-learning division, News University, www.newsu.org, offers the world’s largest online journalism curriculum in 7 languages, with more than 400 interactive courses and 330,000 registered users in more than 200 countries. The Institute’s website, www.poynter.org, produces 24-hour coverage of news about media, ethics, technology, the business of news and the trends that currently define and redefine journalism news reporting. Poynter also is the home of the International Fact-Checking Network (IFCN), more than 60 fact-checking organizations around the world that fact-check claims by politicians, public officials, journalists and others. The world’s top journalists and media innovators come to Poynter to learn and teach new generations of reporters, storytellers, media inventors, designers, visual journalists, documentarians and broadcast producers, and to build public awareness about journalism, media, the First Amendment and protected discourse that serves democracy and the public good. PolitiFact was launched in 2007 to fact-check the 2008 presidential campaign and has since published more than 11,500 fact-checks. It fact-checks television, news and radio pundits through a spin-off website PunditFact, and it has built a national network of fact-checking websites operating in 14 states — including in pivotal presidential primary states such as Iowa, New Hampshire, Florida, Wisconsin, Ohio and Colorado. PolitiFact also is partnering with NBC News and E.W. Scripps Co. to broadcast its fact-checks in 24 local television markets. Among its numerous accolades, Politifact won the 2009 Pulitzer Prize for National Reporting, one of 10 Pulitzers the Tampa Bay Times has earned. PolitiFact is a division of the Tampa Bay Times, a Top Ten newspaper with the largest circulation in the South — an average of 367,936 Sunday and 297,626 daily (AAM Annual Audit 2014). The Times is independently owned by The Poynter Institute. 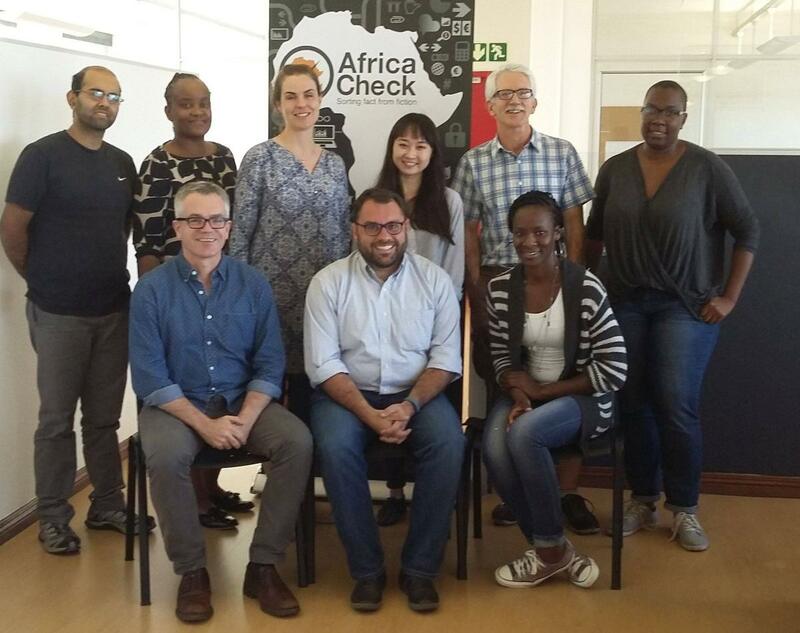 Africa Check was launched in 2012 in South Africa in a partnership between the AFP Foundation, the non-profit media training of the AFP news agency, and the Journalism Department of the University of the Witwatersrand, in Johannesburg, South Africa. In 2015, it launched a French-language version of its site based in Dakar, Senegal, in partnership with the EJICOM journalism school. Since 2012, Africa Check researchers have fact-checked hundreds of claims made by politicians, public figures and the media across countries from South Africa to Nigeria, Senegal and Kenya, producing reports on a wide range to topics on its site and re-published in dozens of outlets across the continent. In 2014 Africa Check launched in partnership with AFP the first African Fact-Checking Awards to foster and support fact-checking by others in the African media.